Coach Gary Ward will be the guest speaker at the January 28th Diamond Dinner, benefiting the Collinsville High School Baseball program. Gary Ward is one of the greatest names in college baseball. 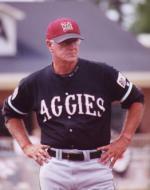 After 21 seasons as a Division I head baseball coach, Ward compiled a record of 1,022-361-1. He is one of the few who have won over 1,000 games in a career. He finishes with a winning percentage of 73.9. At Oklahoma State, Ward led his team to 10 College World Series appearances, 985 wins, 17 Big Eight conference championships (16 in a row), 18 seasons with 40 or more wins, and twelve of his teams finished in Baseball America's top 10. 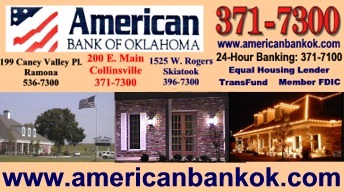 Ward started his career coaching in Collinsville from 1963-1969. Tickets for the event, to be held at the Middle School Commons, can be purchased by contacting a member of the Homerun Club or by calling the club's President Stan Belitz at 371-7288. 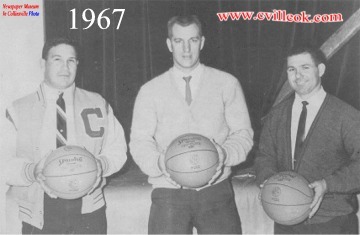 The 1967 Collinsville basketball coaches were (left to right) Jerry Seigel, Gary Ward and Howard Ray. 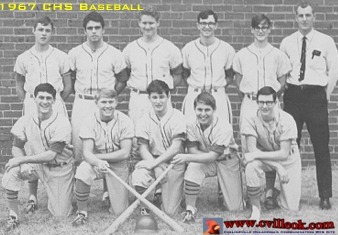 This was Gary Ward's 1967 Collinsville High School baseball team: (L-R) Back Row: Ron Killingsworth, Fred Roten, Jerry Hughes, Dave Rose, J.H. Middleton and Coach Ward. Front Row: Steve Williams, Scott Murphy, Donnie Larimore, James Burwell, and Steve Fulton. For those buying a table for $300 a private meet and greet will begin at 6 PM, social time and silent auction begin at 6:30 with dinner at 7:00 PM. The silent auction will end at 7 PM.